KUALA LUMPUR (Sept 11): The FBM KLCI fell 4.74 points or 0.25% to its intraday low as Asian equity market sentiment was cautious after US President Barack Obama committed to fight against Islamic State militants. The KLCI settled at 1,866.11 points at 5pm. Danny Wong, CEO of Areca Capital Sdn Bhd, said the local exchange was “quiet” and was “trading within a tight range movement” due to a lack of catalysts. “The second quarter results reporting season is over. Since then, there has not been much of a catalyst for the market to run up. "We see that the market moves within only a range of a few points today,” Wong said. However, Wong said investors could look forward to a better third quarter (3Q14) and 4Q14. He described the outlook for the second half of the year as “pretty positive”. “People will be looking for catalyst in 3Q14 as the quarter would have just ended and results will start to flow again. “Bursa has been lagging behind its regional peers in the last few months. We are trading at around the same levels as we were during the end of last year. I believe that the second half of 2014 is the time for us to catch up,” said Wong. Across Bursa Malaysia, British American Tobacco (M) Bhd and Dutch Lady Milk Industries Bhd were leading the gainers table. Main decliners included plantation stocks like United Plantations Bhd, Kuala Lumpur Kepong Bhd, TSH Resources Bhd and Sime Darby Bhd. The most-actively traded stock was Sumatec Resources Bhd. Bursa saw 2.04 billion shares valued at RM1.92 billion traded. There were 412 gainers, 430 decliners and 326 unchanged counters. 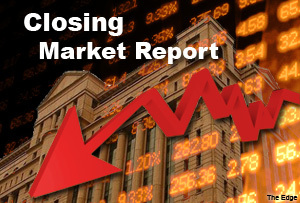 Across Asia, South Korea’s Kospi and Hong Kong’s Hang Seng fell 0.74% and 0.17% respectively.